Come and spend your vacation with us and have a truly relaxing experience in your home away from home. Only 2 blocks from the beach. The Hiilani Suite is a ground floor Apartment with approximately 800sq ft. that sleeps up to 4 people. One queen size bed in one room, a single bed in a small second bed room, and a trundle bed in the large living room. For your own comfort you find a couch and recliner chair, television and VCR, two air conditioners, two ceiling fans and a telephone for local calls. The fully contained kitchen provides you with everything you need for a full meal. Washing machine and dryer is available. Private backyard with covered patio and BBQ. The beach access is right across the street from Omao Street, which is the street our guests walk down to get cross Kalaheo Ave.
A travel crib will be available for our little guests. We also offer beach chairs, mats, towels and boogie boards for your convenience. What a nice winter vacation. We had the most wonderful stay at Auntie Barbara's Vacation rental. The Hiilani apartment was spacious enough for the 5 of us and with a furnished kitchen, tv, washing machine ect. The WiFi was working ok but not in all corners of the apartment. For us living next door to Barbara was very helpful. Coming from overseas she was a very helpful tour guide for us. The Kailua area was nice and the apartment is within walking distance from the beach. We needed a place for myself, my husband, our 2 year old, and my in-laws, in Kailua. Auntie Barbara's 2 bedroom apartment turned out to be just right for our family's needs. Barbara was always very understanding and helpful. We look forward to coming back someday! We had a memorable time in Kailua. The accommodations were perfect for three adults. 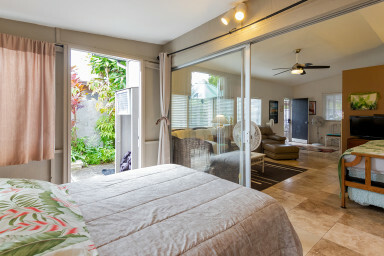 Just a short walk to Kailua Beach and convenient to restaurants and grocery stores. We would definitely be back. We loved the Hiilani apartment very much! It was very clean and had more than enough space for the 3 of us. The cupboards were stocked with the basic necessities. Very comfortable and clean. We fell in love with Barbara she was so kind and helpful. We hope to come back again next summer. The Hiilani apartment/guest house was a comfortable space for us (2 adults and 2 teenagers). Fully stocked kitchen with staples was a big benefit. Being able to walk to a nice beach in 5 minutes was wonderful. We appreciated the available boogie boards as well as snorkels and masks. Kailua was a good location away from the crowds, but still easy to get over to Pearl Harbor and other places on the island. Barbara was a lovely host. Great home to rent. 2nd Floor apartment has the best view. We would certainly return.